"All the information you need… A must-have!" Plus comprehensive detail on additional eating disorders and nutrition topics. Information is geared in a way that any health professional can utilize, whether experienced or brand new to eating disorders care. 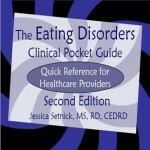 The Eating Disorders Clinical Pocket Guide summarizes the best and most practical data from a whole shelf of eating disorders books into an easy-to-use format. Find what you need at a moment's notice. Sturdy construction will stand up to daily use. "Search no more! The Eating Disorders Clinical Pocket Guide offers the solution to your quest for information for your patients with eating disorders." - Reduced prices available for orders of multiple books shipping to the same location. - Additional quantity discounts are available for orders larger than 25 copies. If you are a bookstore or would like to order for your entire staff, please call 214-503-7100 for information. - We allow instructors to review our books at no charge. Please call 214-503-7100 if you are an instructor considering this book as a textbook or required reading.